Engineers take motion pictures of the thrust augmentor flame. In this historical photo from the U.S. space agency, the Ramjet I-40 engine is pictured in the Jet Static Lab on Oct. 23, 1946, showing the making of high speed motion pictures of thrust augmentor flame. 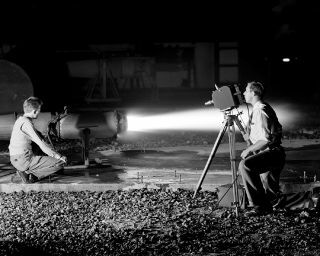 Engineers are taking motion pictures of the exhaust gases being discharged from a special burner used for studying thrust augmentation in jet-propulsion engines at the Flight Propulsion Research Laboratory of the National Advisory Committee for Aeronautics, Cleveland, Ohio, now known as John H. Glenn Research Center at Lewis Field.